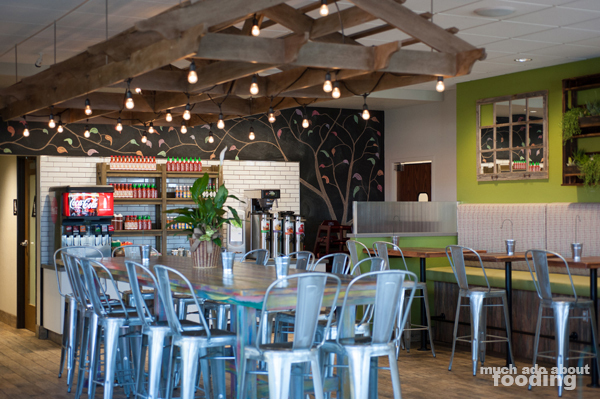 A mighty congratulations to Green Tomato Grill on the opening of their second location! We have really enjoyed all of the times we've popped into the original restaurant in Orange because it is guaranteed that a healthful, wholesome meal will be had that is also price-conscious and tasty. I'd have to say that it's a reason to look forward to having service done on my car because GTG is so nearby; I just have to stop in! When we had last talked to Chef Kyle Markt about the restaurant's plans, he hinted at there being a second location in the plans (and maybe even more!) but only now can Orange County get that blessing. 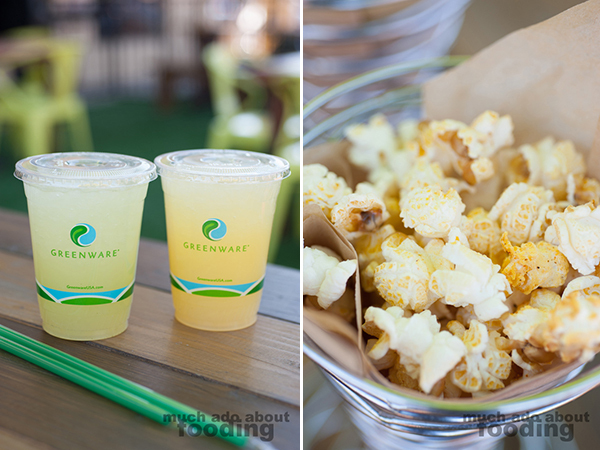 The opening of a Brea Green Tomato Grill is definitely a great addition to the area, and when we went over to visit upon invitation, we were happy to see that while some things have changed, the deliciousness of the food hadn't! Right away, what was a welcome sight was how the branding for the restaurant carried over well to the Brea location. It certainly looked and felt like a Green Tomato Grill but with much more space and seating. Chef Kyle was quite proud of the design and especially of the tables that were made from wood reclaimed from an old barn that stood in the same city he grew up in. If you were familiar with the outside patio at the Orange location, you'll appreciate seeing how it was recreated here, complete with a matching fountain and the same dog-friendly policy. To quench our thirst that hot day, we chose cups of their Agave Lemonade ($2.95/$3.45) which came in several flavors - pineapple berry, cucumber ginger mint, jalapeno mandarin, and seasonal (beet watermelon soon). As always, each sip was refreshing, and the flavors of each were well incorporated. If you're more of a coffee person, they do carry Kean coffee, even in cold brew! We start with the Chile Lime Popcorn ($1.25 - lime juice and adobo seasoning), reveling in how evenly and deliciously seasoned it was. 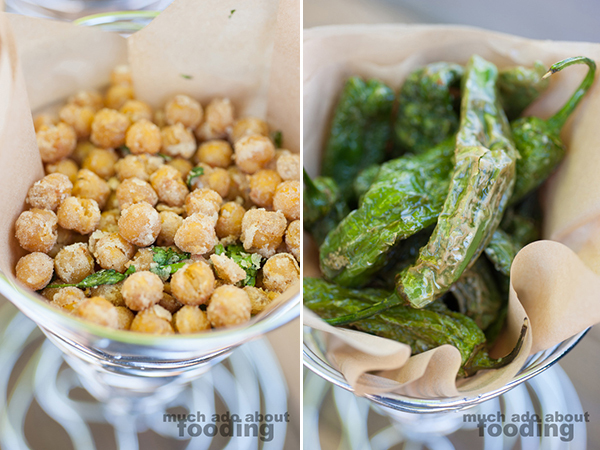 I couldn't get enough of it nor could I stop popping Crispy Chickpeas ($2.45 - tossed with rice flour and adobo and flash-fried with cilantro) into my mouth because they were just as satisfying as I remembered. The crisp on these was just enough to yield to a bite but soft enough to let the chickpea's meatiness still shine through. The table also finished the Shishito Peppers ($2.95 - blistered and tossed with lime juice and adobo seasoning) quickly because they were easy to eat and tasty to boot. 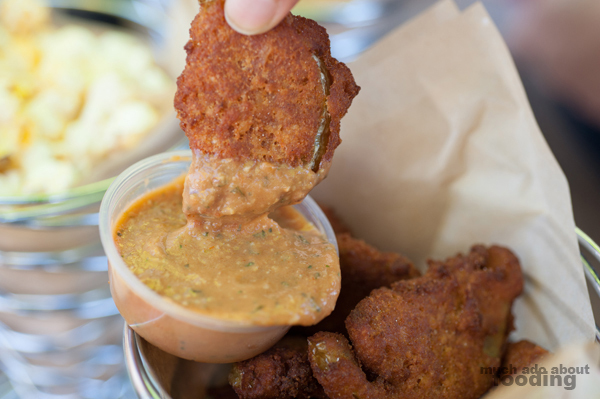 But ah, we cannot forget the namesake item on the menu - the Fried Green Tomatoes ($2.95 - semi-pickled green tomatoes, egg wash, gluten-free panko crust and served with GTG sauce). Battered and fried, these half moon pieces were crunchy but also tart. It was an easy share with the rest of the table, especially as we watched the waitstaff arrive with their BBQ Pulled Pork Melt ($8.45 - Creekstone Farms braised pork sauteed with cabbage, onions, shishito peppers, and Chipotle BBQ sauce in a grilled flatbread with Cheddar Jack cheese), accompanied by more sauce on the side for additional coverage. Chef Kyle told us about the partnership he had struck with a responsible, conscious pork purveyor and how he plans on continuing to leverage those relationships for other protein sources. 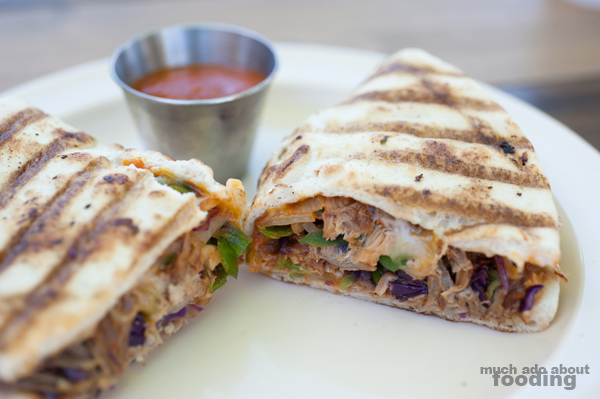 They're doing great things over at Green Tomato Grill! 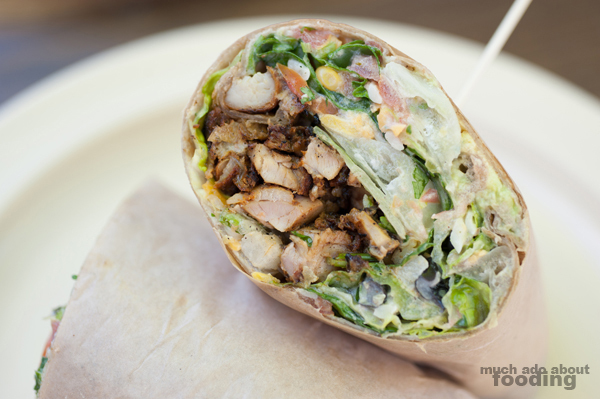 Next up came the Chicken Ranch Wrap ($8.35 - grilled chicken and avocado with black beans, corn, cilantro, jicama, Romaine, tomatoes, Cheddar Jack cheese and Greek Ranch in a chipotle tortilla), a suave and savory wrap with just the right amount of sauce, crisp lettuce crunch, and hearty chicken and avocado. There'd be no problem filling up on one of these during lunchtime. 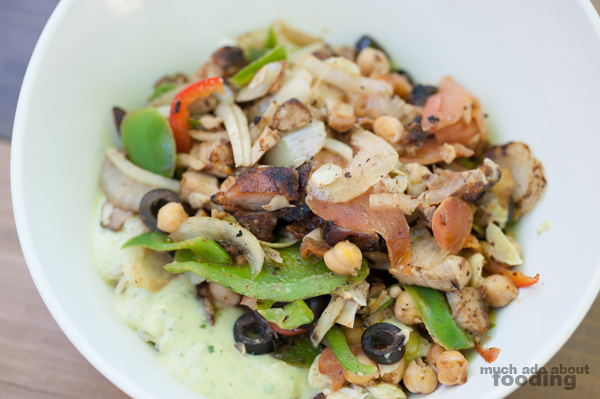 Despite how good the wraps are at Green Tomato Grill, I've always been a fan of their bowls. Guaranteed to be savory but also well-balanced and health-conscious, these come in a variety of styles and are complemented by a variety of housemade sauces (that menu has expanded since we last visited and now includes Chile Verde, Habanero Fire, Mediterranean, GTG Sauce, Thai Peanut, Tzatziki, Chipotle BBQ, Agave Lime Vinaigrette, Caesar, Miso Vinaigrette, Greek Ranch, Greek Vinaigrette, and Chipotle Ranch). We start with the Mediterranean Chicken Bowl ($7.45/$8.95 - grilled chicken sauteed with artichoke, bell peppers, black olives, onion, garbanzo beans, and tomatoes over brown rice with Mediterranean sauce), certainly a bowl made for the person who needs a hefty portion of protein while still dishing up enough vegetables for balance. The sweetness from the sauteed bell peppers helped round out a very savory bowl. 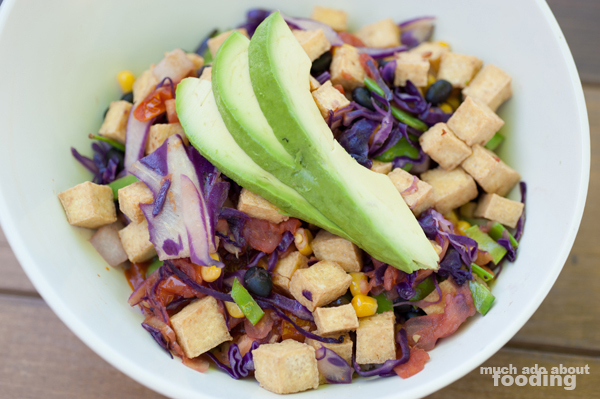 Then we dug into the BBQ Crispy Tofu Bowl ($7.45/$8.95 - crispy lemongrass tofu sauteed with black beans, cabbage, corn, jicama, snow peas, tomatoes, and avocado over brown rice with Chipotle BBQ Sauce), one of my personal favorites here at GTG. Something about the way that the tofu pieces are crunchy but still soft inside and come in the perfect diced size makes me really enjoy how they handle their tofu. This one is very much full of color and life with bright flavors and plenty of crunch. Next up was the ever popular Hawaiian Ahi Tuna Poke Bowl ($9.95 - wild raw ahi tuna tossed with avocado, cucumbers, edamame, onions, and Sriracha sesame vinaigrette topped with seaweed and sesame seeds, served over white/brown rice), a generous serving of ahi lining the top of the bowl. 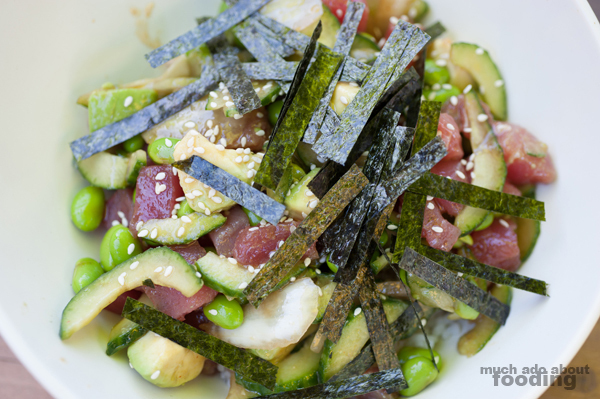 This one is great for the poke lover who also wants a little more to the dish than just sauce and fish. I especially enjoyed the edamame in this one. Lastly, to finish, Chef Kyle did have something new to show off - a partnership with Acai Republic to provide options for acai bowls. 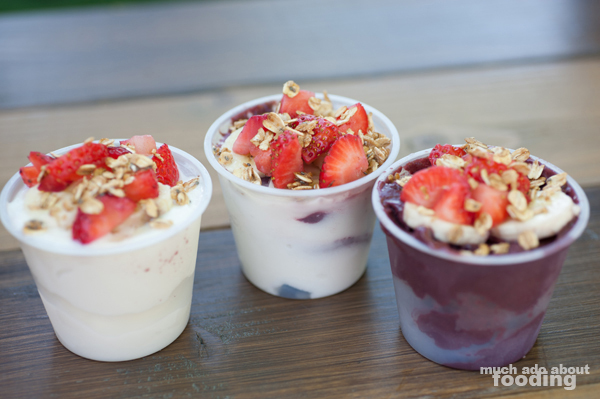 These come with topping choices such as granola, strawberry, banana, shredded coconut, carob chips, and agave. One could order just the Organic Yogurt ($5.25/$6.95 - Cloud Top frozen organic tart yogurt) with toppings for a fro-yo treat while another might get the Real Brazilian Acai ($5.25/$6.95 - Acai Republic Acai blended with strawberries, bananas, blueberries, and guarana) to stay on a stricter health-focused plan. The most boasted about product, however, was that Chef Kyle had found a way to swirl the two parts together. 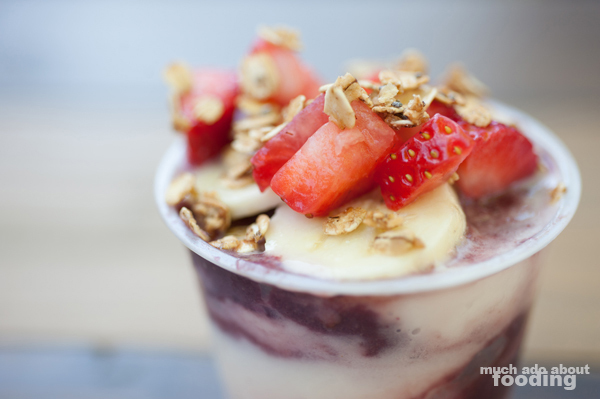 The Swirly ($5.25/$6.95 - Real Brazilian Acai and Organic Yogurt swirled together) option takes the best of both worlds and as far as the chef knew, was only served (or even first invented?) at Green Tomato Grill. Overall, these options were created of great quality and you just can't go wrong with any choice you make. 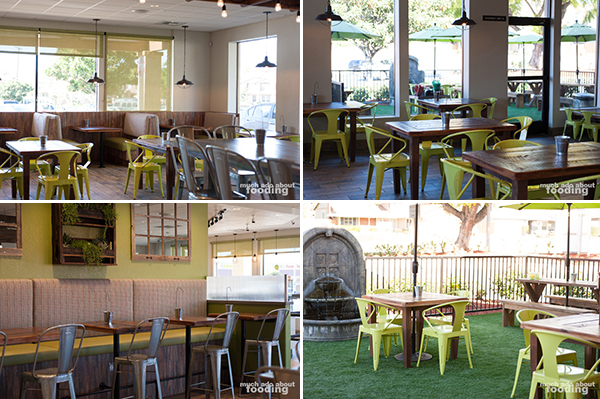 If you have plans to visit, find Green Tomato Grill's Brea location at 796 N Brea Blvd, Brea, CA 92821.